The evening gospel is a study in contrasts. This meal at the home of Simon the Leper is juxtaposed with the meal in the upper room, the last or mystical supper. It is a tradition that Judas Iscariot was the son of Simon the Leper. The sinful woman is contrasted with the elite apostle, one of the twelve. 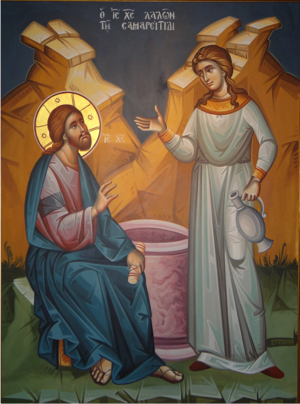 The woman finds salvation through an effusive outpouring of expensive myrrh, the apostle disapproves (though not alone in his disapproval), feigning a virtuous love for the poor. “A woman came up to him with an alabaster jar of costly perfumed oil, and poured it on his head while he was reclining at table. She has done a good thing for me …. In pouring this perfumed oil upon my body, she did it to prepare me for burial” (Matthew 26:7-12). But “one of the Twelve, who was called Judas Iscariot, went to the chief priests and said, “What are you willing to give me if I hand him over to you?” They paid him thirty pieces of silver. (Matthew 26:14-15)” What does betrayal of the Lord mean? It was for this action of Judas that this Wednesday was called “Spy Wednesday,” and that abstinence was prescribed for Wednesdays. The holy nun Cassia wrote a beautiful sticheron on this theme. The corpus of her works is not large, but very important, it includes also the doxasticheron for Christmas.